We had all been cooped up too long inside because of the rain. The children were growing restless. I was in the armchair by the window watching my son thump his sister over the head for the ninth time with a big red picture book. My spirits had sunk into a wet-weather torpor, which is why I had not tried to stop him the previous eight times. Thwack! He did it again. Again she cried out in protest: lashed out to hit him: retreat: running footsteps: maniacal laughter. You could see from the way my daughter clenched her fists that chaos was about to consume us all. Wearily I roused myself, remembering my solemn duty to maintain a semblance of moral order in this domestic menagerie. I stood. I strode down the corridor, pausing in front of a mirror to check that my appearance was sufficiently dignified. The Representative of Moral Order can scarce afford to let himself go. I entered my son's bedroom. He was not there. I slid back the wardrobe door. There he was, crouching in the shadows of hung clothes, clutching his red picture book and grinning like a gangster. My daughter came into the room after me. Thwack! Quick as lightning the boy had leapt out from his hiding place and clobbered her again. She shrieked. I knew that thunder was crashing somewhere in the distance on this dark globe. I apprehended the offender before he could make his getaway. I knelt down among the ruins of lego to look him squarely in the eye. He looked back at me the way James Cagney looks at the policeman in one of those old movies. I cannot remember whether he had a cigarette dangling from the corner of his mouth. It was not his fault. The boy was born in sin: his father and his father's father were sinners before him: and besides, it had been raining for three days straight. Very sternly I spoke to the little outlaw. "Son," I told him, "son, I need your help." I saw a glimmer of virtue returning to his eyes. "I've got a very important job for you. Do you think you can do it? Or..." – I glanced around the room – "shall I find someone else?" He stood up very straight, a tiny man ready to make his mark upon the world. He promised: "I can do it." I looked him up and down with a sceptical eye. He implored me: "I can do it." Take it from me, reader, your six-year-old boy is no different from a grown man in this respect, that he loves nothing better than having a job to do. It makes him feel very grand. It takes his attention away from other things, like perpetrating random acts of violence with a picture book. "What I need, my boy," I told him, standing up straight and tall and hitching my thumbs into my trousers, "what I need is leaves." "Ah!" said the boy, all interest. "Leaves!" He put down the picture book. He looked up at me with new respect. "Here's what I need you to do," I told him. "First, put on your gumboots. Second, get your umbrella. Third – are you still listening?" His eyes begged me to continue. "Third, I want you to go outside and collect thirty different varieties of leaves. Thirty – each one different from all the others – do you understand me?" The boy did not answer because he was already halfway down the hall, hopping wildly on one foot and pulling a boot on to the other. Before I could even congratulate myself on a job well done, the little chap had seized his umbrella and flung himself out into the yard where he set at once to work scavenging among the shrubs and trees. It's exactly as I told you, reader: a boy likes to be gainfully employed. Forty minutes later he was still bringing in the leaves. This was no shoddy workmanship either. No cracked leaves, no dry or haggard specimens, no duplicates slyly passed off as different species. Each leaf was a work of art, distinct in shape and vivid in colour, lovingly plucked and brought inside and arranged on the table, all glistening with rain. My son set them out neatly, side by side, sorted according to the principles of his own mysterious taxonomy. When he arrived with the fifteenth leaf and laid it down with all the rest, I complimented him on the collection. I confessed that I never even knew there were so many varieties of leaves in our garden, or that they were so beautiful. He hurried out again into the rain and was gone a long time. It was nearly dark when the boy came back inside. He stamped mud across the floor and flung down the wet umbrella. He stood there glowering at me with a thundercloud in his face. I was about to inquire if something was the matter when he blurted out, "Thirty! We don't even have thirty different kinds!" He crossed his arms and turned away from me, shaking with rage. I tried to reassure him. "It doesn't matter. How about twenty? Twenty leaves will be enough. Twenty will be fine, just fine." "We don't have twenty," the boy snapped back. "Fifteen! There are only fifteen types of leaves. How dare you tell me to get thirty. It's impossible." There would be no more leaf-gathering today, anyone could see that. Now that he had declared a strike, there would be no way under heaven of getting my disgruntled labourer back on the job. Not that it had been a complete failure. It had kept him occupied for the better part of an hour. It had dramatically reduced the incidents of violent crime in our living room. But now I had other problems to deal with. "I'm sorry," I said. "Honestly, fifteen leaves will be plenty. I really don't need thirty." "Don't need them!" he spat the words back at me like a curse. "Don't need them!" Like cursing a second time. "You have done a good job," I said. "It is very good. The leaves are excellent." We stood there together looking at them spread out across the table. But my son was no longer pleased with the leaves. He was in one of those glass-half-empty kinds of moods. What I saw were fifteen flawless, glistening leaves, lovingly gathered and assembled. What I saw was a job well done. What he saw was the other fifteen leaves, fifteen missing leaves, fifteen impossible-to-acquire specimens. What he saw was a job half-done. And I don't think I have to tell you that it made him very, very cranky. I reached out a fatherly hand to comfort the boy, but he lurched away from me. In a single motion, swift as death, he swept up all the leaves into his arms and began to crush them. An involuntary cry escaped my lips: the leaves! But there was no stopping him now. He tore them, smashed them, pulverised them, scattered them across the floor like so many dead leaves. It was, in short, a tantrum against all the glory of nature. Like any boy in such a mood, he would have destroyed the universe, and more besides, if he had had it in his power. I turned and left the room, whistling a Frank Sinatra tune as though nothing had happened. Fly me to the moon and let me play among the stars. I felt for the boy, reader, please believe me when I say that. But the Representative of Moral Order mustn't encourage tantrums against the glory of nature. No good will come of it. I picked up a comic book and sat down to read it, still whistling from time to time. Fill my life with song and let me sing forevermore. Minutes passed. I wondered if the boy was ok. No sign of him anywhere. The night train rattled by. I turned the pages of the comic book. Then I heard a sort of rustling. I looked up. Before me stood the boy. He stood there facing me, arms by his side, saying nothing. He waited for my full attention. Neither of us said a word. I closed the comic book and put it down. He raised a hand and I saw that it held one of the leaves. One last big perfect maple leaf that had not been destroyed. I smiled at the sight of it. I was glad one leaf had been saved. I was pleased that all his hard work had not been for nothing. For one rash misguided second I thought he had brought it as a peace offering. That was before the child calmly placed the maple leaf into his mouth and ate it. His gaze was fixed on me as though by nails. His face was as blank as stone as he slowly moved his little jaws, chewing the leaf over and over, crushing the lovely organism between his molars. When he had done this for what seemed a very long time, he turned and left the room. I went into the kitchen just in time to see a small boy leaning over the railing outside and spitting bits of leaf into the garden. Five minutes later he had forgiven me and we were building lego houses on the floor. We never spoke of the leaves again. 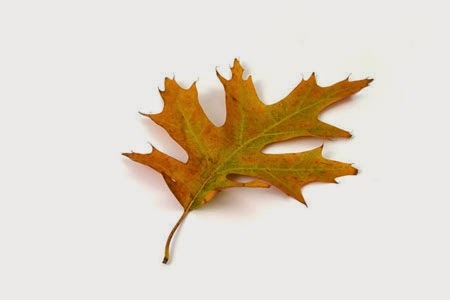 But today, when nobody was looking, I went out in the yard and plucked a single green leaf from the maple tree. Autumn is here and there are only a few green leaves left. I wanted to get one before they are all gone, before they have all turned red and fallen to the cold earth. I held the perfect leaf up to the light, studying the tiny veins. I turned it over in my hand. Then I raised it, very tentatively, and put it in my mouth. I bit down once, winced, and spat. It was just as I thought. Like eating poison. I considered the way the boy had chewed it over and over, eyes hard, face like stone. The taste of maple leaf lingered in my mouth. I thought: Shakespeare: Dostoevsky: the Bible: it is all true. And my heart thrilled with love and fear.